Before 1982 there were no local animal shelters or resources available to help the Sonoma Community cope with the problem of stray and abandoned animals. This lack of animal services motivated a handful of dedicated animal lovers to join together to create a local animal welfare organization. Thanks to the support and dedication of this unique community, the shelter property on Eighth Street East was purchased, and Pets Lifeline was established. During its first years of growth, animals were housed in makeshift quarters or placed in temporary foster care. Our main effort was to find new homes for stray dogs and cats (those not lucky enough to be reunited with their owners). Adoptions were scheduled “by appointment only” because of limited resources. The Shelter as we know it today was built and opened in 1987 to accommodate 13 dogs and 40 to 50 cats. With the help of foster care volunteers we are able to help many more animals than our licensed capacity allows. Visitors are encouraged to come to the Shelter to see our dogs and to socialize with the cats and kittens in our two community cats rooms. 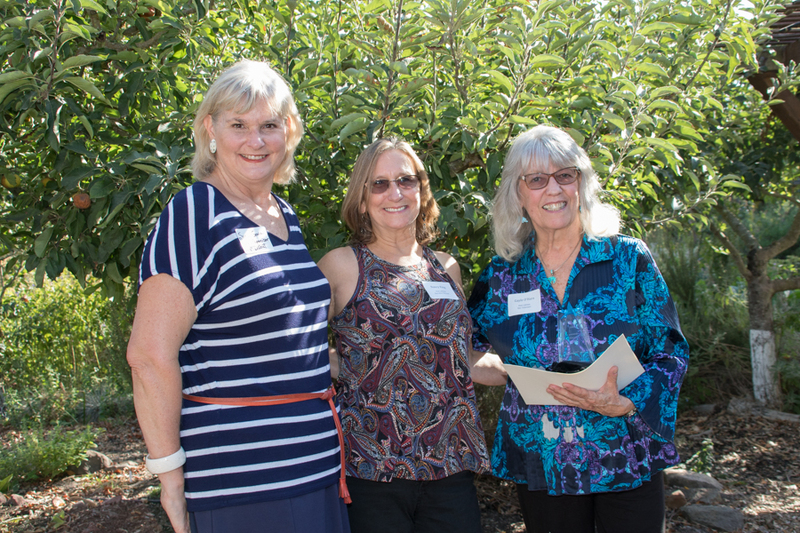 Gayle O'Hara accepts her 2015 Star Award from Pets LifeLine ED Nancy King and Supervisor Susan Gorin. Pets Lifeline owes a lot to its amazing Star Volunteer, Gayle O’Hara. Gayle is proof that cat ladies rock! For ten years she has provided invaluable adoption center support by sharing her charisma, experience and knowledge of the shelter with visitors and new volunteers. She does so much that the organization could not possibly fit it all in a short description and instead wants to say thank you so very much Gayle for your commitment to the mission of Pets Lifeline.